Dr. Ginsberg accepts the following list of insurance providers. Select your insurance provider to see more details. I am a body-imaging radiologist who specializes in imaging of the chest. My work involves the detection and characterization of tumors in this region of the body. 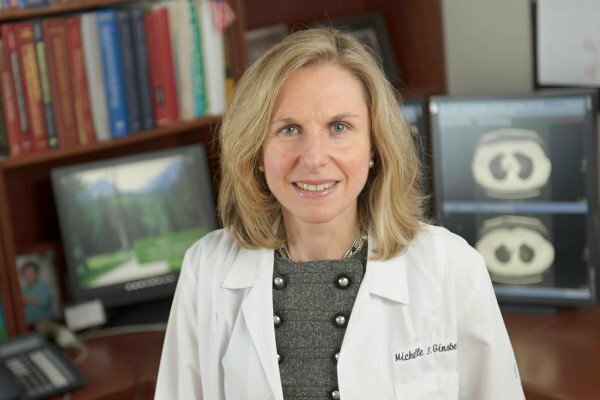 As Director of Cardiothoracic Imaging, I work closely with my colleagues across Memorial Sloan Kettering to determine the best way to treat thoracic cancer. My goal is to provide high-quality, effective, and compassionate care to our patients. I have dedicated my work to improving the detection and diagnosis of thoracic cancers and their complications, such as pulmonary embolisms. My research has focused not only on the detection of tumors but also on better understanding and measuring them. Recently, I have concentrated on characterizing lung cancer tumors with genetic mutations. I am also very interested in computer approaches to studying CT images. With advances in technology, we can automatically detect tumors and tell them apart from normal tissue. I have participated in many clinical trials that use imaging to see how a tumor responds to treatment. I am particularly passionate about MSK’s Lung Cancer Screening Program, which I helped launch. People who had already had cancer and were screened through this program had a higher rate of lung cancer diagnosis, compared with previously published studies. This suggests that lung cancer screening for these people may help save lives. Findings like these make my work as a radiologist extremely rewarding. Teaching and mentoring medical students, residents, fellows, and junior faculty has been of great value in my career. As Vice Chair for Education in the Department of Radiology, I focus my clinical, administrative, and academic efforts on the future of oncologic radiology education. It is an area that I am deeply committed to. Visit PubMed for a full listing of Dr. Ginsberg’s journal articles. Pubmed is an online index of research papers and other articles from the US National Library of Medicine and the National Institutes of Health.